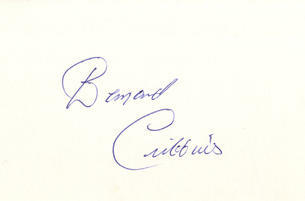 This is a Hand Signed white card 5.5" x 3.5" by the English character Actor and Comedy Musician who has appeared on Television and in 3 Carry On Films. Bernard Cribbins, OBE (born 29 December 1928) is an English character actor, voice-over artist and musical comedian with a career spanning over half a century who came to prominence in films in the 1960s, has been in work consistently since his professional debut in the mid 1950s, and as of 2012 is still an active performer. He is particularly known to British audiences as the story-telling narrator in The Wombles, a children's programme which ran for 40 episodes between 1973 and 1975. He also recorded several hit novelty records in the early 1960s and was a regular and prolific performer on Jackanory on BBC TV between 1966 and 1991. Cribbins' most recent prominent role has been as Wilfred Mott, companion of the Tenth Doctor in Doctor Who.